This year, I spent my Thanksgiving surrounded by family and friends, mesquite and “y’alls” in Austin, Texas. The dinner was potluck style, and while the food was pretty damn good (more cranberry tangerine relish or green chile-pinon cornbread stuffing, anyone?) it didn’t stop the day-after-Thanksgiving-blues from hitting me hard. It’s hard to go back to chilled turkey meat and cold mashed potatoes after a four-hour marathon meal the day before. This year, instead of opening the fridge and rifling through various foil-covered containers, I headed to downtown Austin with family in tow. What was I searching for? 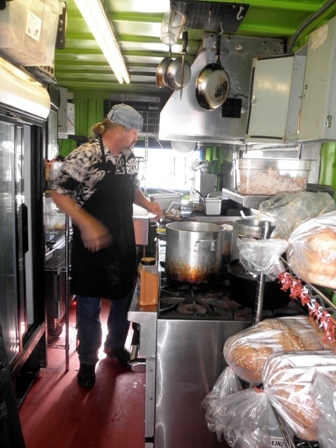 The perfect antidote to the Thanksgiving blues: the food truck. If you’ve ever lived in a major metropolitan area, then you probably know what I’m talking about. The clichéd version is a large delivery truck coated in quilted stainless steel siding that serves sandwiches to construction workers at lunchtime. In reality, these mobile restaurants can be found in almost any metropolitan area, and they don’t limit their menus to just ham and Swiss. In fact, over the past decade, these gourmet restaurants on wheels have been changing the way diners eat out, especially in highly populated areas like business and civic centers. There are so many food trucks in Austin—some stationary in parking lots, some migrating from one corner to another—that it can be hard to pick a location and cuisine. Don’t worry, though, because there’s an app for that (actually, there are several). Not only can you search for the ideal cuisine online (www.AustinFoodCarts.com and www.MobileCravings.com are both great resources), you can follow your favorite trucks on Twitter for up-to-date locations, or download an app on your iPhone or Windows mobile phone to get descriptions and locations. If you aren’t technology-dependent, you can also resort to the tried-and-true method of drive-and-spot—food trucks in Austin are flamboyant and plentiful. It took us about a minute of driving along Congress Street to spot one parked in the shadow of a skyscraper. 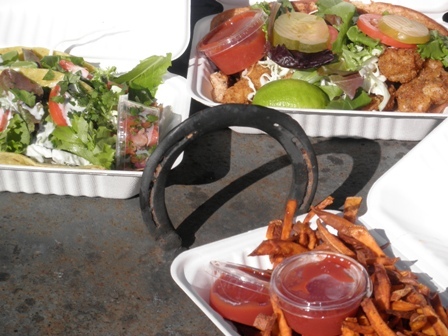 Lucky for us, gut instinct led us to Turf-N-Surf Po’ Boy parked on the corner of Willie Nelson and Congress. Turf-N-Surf looks like a marine shipping container on LSD. Barnacles have morphed into plastic lobsters, and neon surfboards cover the wall willy-nilly. A collection of porch swings, park benches, and steel tables sit out front. 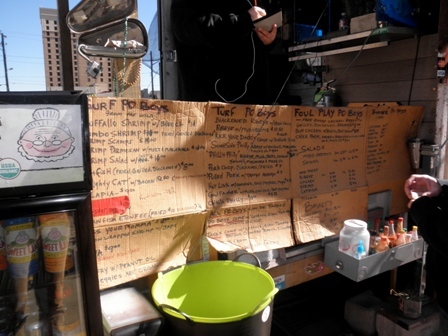 The menu—delightfully—is written in thick black marker on creased cardboard. Talk about rustic. Ralph in his kitchen. The menu at Surf-N-Turf. Shrimp tacos, pulled pork po’boy, and fries. Turf-N-Surf is run by Ralph Gilmore and his daughter Kirsten. Ralph, a Brownsville native, used to build custom Harleys and custom homes. He gave up running two lube shops in Houston a couple years back because, he says, he always loved to cook. Cooking runs in the family; Ralph’s brother owns the famous Z’Tejas restaurant chain. When asked why a food truck, Ralph says he likes the low overhead because it allows him to cook and serve the best food at a good price. There’s a kind of euphoria one feels after a truly great dining experience,and it took one bite of those shrimp tacos and that po’ boy for all of us to be feeling it. It didn’t matter that we were sitting at a metal table on the side of the road. Not wanting to lose our high, we thanked Ralph and Kirsten and headed off in search of dessert. We left the business district to try our luck in a different part of downtown Austin. Our attention was caught by a crowd milling around a dirt lot on the corner of South Congress and James Street. The dirt lot was home to several different food mobiles, but we were drawn to a vintage Airstream crowded up against the sidewalk. 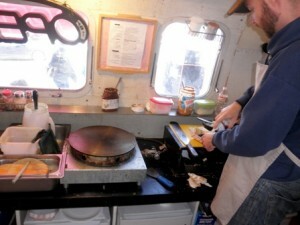 The Airstream is home to Crepes Mille, a creperie run by two young men, Pong and Ben. The creperie serves savory crepes, from BBQ briskit to pink salmon to crepes made with traditional Thai ingredients. But we had come for the sweet crepes, and Crepes Mille did not disappoint. We ordered their famous berry delight crepes, caramelized pear crepes, and banana/Nutella® crepes. Not only did the food taste fantastic, but it looked good, too. It’s hard to say exactly what it is about food trucks that make them the perfect anti-Thanksgiving meal. Perhaps it has to do with their convenience and affordability. Perhaps it’s the varied and unique cuisine coming out of those tiny, makeshift kitchens. Perhaps it’s something more. 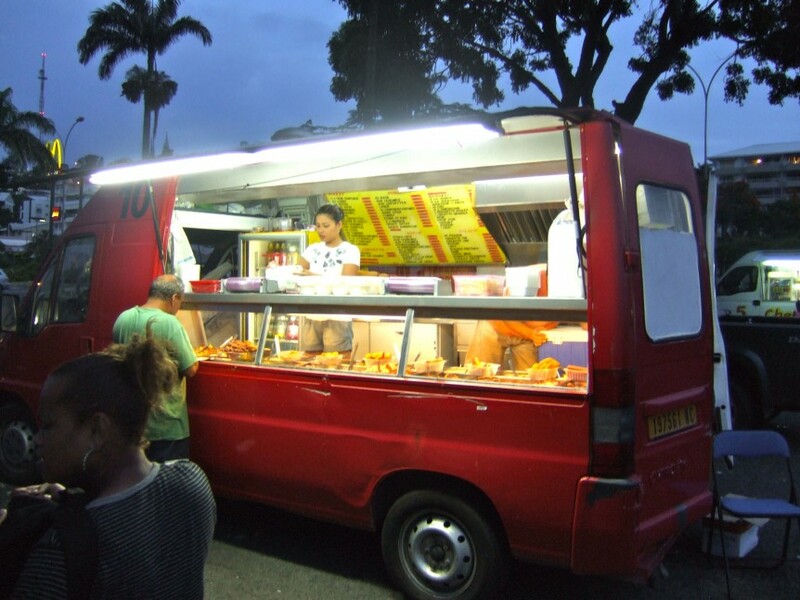 Food trucks are a way to explore urban culture. There’s a sense of community about them—no one blinks twice if you twist in your seat to see how the next table over is enjoying their meal, and oftentimes the chefs are more than happy to pause and make suggestions from their menu. Diners and chefs alike are on a culinary adventure that’s as unpredictable and exciting as cold leftovers are boring. Kelli Bergthold is the Associate Editor for the Fiery Foods & BBQ SuperSite. Raised by a family of foodies, and the daughter of a devoted chilehead, Kelli spends far too much time thinking, eating, and writing about food. Baking is her personal vice. She graduated from the University of New Mexico with a degree in Creative Writing, and now divides her time between New Mexico and Southeastern Alaska.